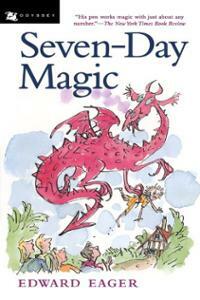 Seven-Day Magic depicts of five friends that cross paths with a magical book from the library. The librarian explains that the book must be returned after seven days. At first, Susan, John, Abbie, Fredricka, and Barnaby sense no abnormalities with the book. However, as they begin to read it, they discover that the book is about none other than the five children themselves. Diving deeper into the many capabilities of the magic book, they uncover the future adventures that the book can mold. Obeying the children’s every command to an extent of danger, the book acts as a genie that follows the base of a wish while adding gruesome details. Fredricka experiences the book’s guidelines firsthand when she wished for a grand magical adventure. Instead of a merry enchanted world, a dragon kidnaps her and plans to eat her as a snack. As the five children are warned of the dangers of the book, they learn to save Fredricka and start to change their carefree attitude towards handling the magic novel. They continue to explore the outcomes of wishing on the book, both positive and negative. The children pursue their adventures by interacting with an unfinished story’s character and learning their grandmother’s history and memories. Despite their amazing adventures, conflict between the characters increase as the return date nears. The enchanted pages of literature test the childrens’ trust and toy with their emotions and lives, increasing the possibilities that will be selected to make the ending. Edward Eager’s novel, Seven-Day Magic, first attracted my curiosity when it suggested the idea that something like a magical book exists. However, as I flipped each page, I realized I was agitated by its failure to include suspense and excitement. Instead of slowly building a lead up to drag me into the story, the novel simply spewed out facts of the story. The characters were not as interesting as I thought they would be, as I did not feel as though I connected with them at dramatic moments. The story was very interesting, although I would have prefered a different way of narrating the tale to the reader. Overall, the elegant story and simple narration made me recommend this to younger middle school students. I believe Seven-Day Magic deserves a rating of six out of ten stars. Sadly, if I were able to, I would like to choose a different book. 2. What peculiar event is taking place and what is causing it? 3. Where did the dragon come from? 4. How did the children defeat the dragon that had captured Fredricka? 5. How was Susan’s wish different from Fredericka’s? 6. Who did the children meet and what was his/her name after Susan made a wish? 7. Why do you think the baby feel vengeance towards the little girl? 8. How do the remarks of the passengers of the train support the personality of Baby? 9. Why was Grannie angry at Barnaby? 11. How was Abbie’s wish different from Grannie’s? 12. Why was the director mad at Abbie’s father? 13. Why did Barnaby wish to be a strong knight? 14. Why were the children hesitant to return the magic book? 15. Why do you think Miss Dowitcher gave the children a strange look they returned the magic book? 15a. Miss Dowitcher’s strange glance signaled that she assumed the children would not survive the book’s dangerous magic.